Posted April 27, 2017 by Andler Dental & filed under Dental Articles, Dentistry, Oral Health. Every year, April is recognized as Oral Cancer Awareness Month. At our dental office in Madison, we strive to keep our patients and our neighbors as healthy as possible, so we’d like to join in and help educate our community on the risks of oral cancer, how to identify it, and why it’s best to identify it as early as possible. One of the main reasons oral cancer is so deadly, and those numbers above are so scary, is that most of the time, oral cancer is caught too late and may have already spread to another part of the body. Unlike other types of cancer, there are no official timing guidelines for screening for oral cancer, like there are for, say, colon or breast cancer. This is one reason why we recommend seeing your dentist in Madison at least every six months for a thorough examination. 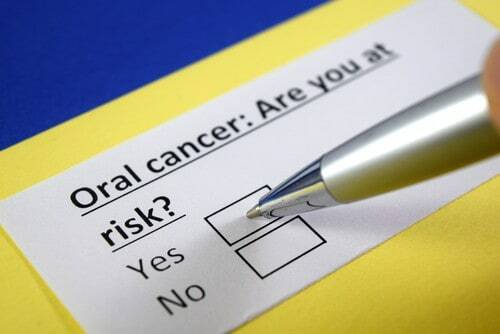 If caught in its early stages, oral cancer can be treated successfully. The difficult part to suspecting and diagnosing oral cancer is that its signs and symptoms can disguise themselves as other oral health problems that don’t seem like a big deal, only a minor annoyance. If you notice any of the signs below, call your dentist as soon as you can. If you suspect you’re at risk for oral cancer or have additional questions, we welcome you to call our Madison dental office.